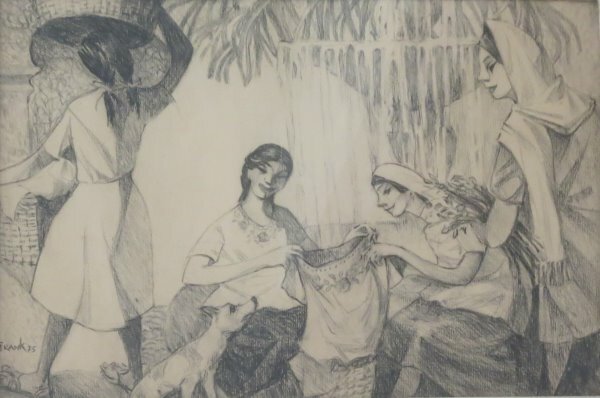 Frank Ward Kent (1912-1977) was a talented illustrator and painter who lived at Lake Chapala for much of the last decade of his life, from about 1968 to 1976. Born in Salt Lake City, Utah, on 16 February 1912, Kent spent much of his youth riding and sketching in the Teton Mountains and is best known for his landscapes and scholarly portraits of Native Americans, including the Shoshone and Blackfoot Indians. He later turned some of the sketches into paintings. 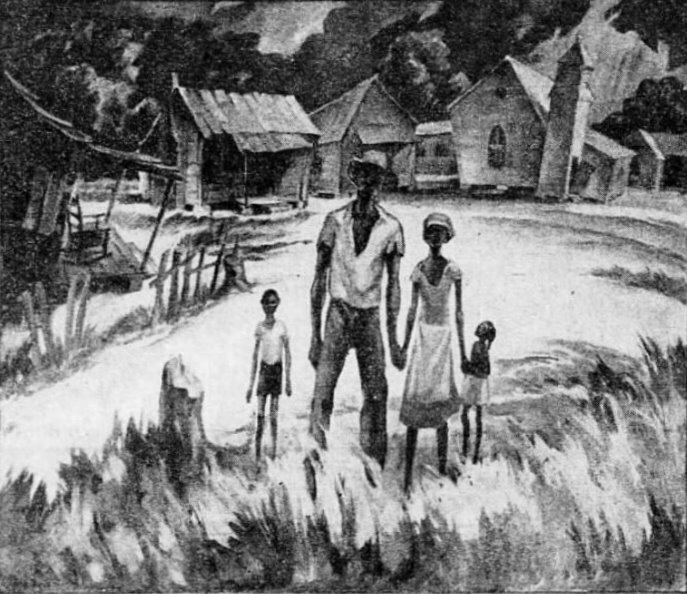 In the 1940s, Kent completed many social realism paintings depicting racial and social problems. Kent began his formal education at the University of Utah (1930) before studying art at the Chicago Art Institute (1931), the Art Students League in New York (1931-32), and privately in Paris, France (1934). At age 23, he married Helen Gladys Allred, 25, of American Falls, Idaho, in June 1935. Frank Kent. ca 1975. Lake Chapala shoreline. Reproduced by kind permission of Katie Goodridge Ingram. Kent completed a Bachelors degree in Fine Arts in 1937 and a Masters in Fine Arts in 1938, both from Syracuse University, New York. He worked as an illustrator for Wild West magazine in New York and also worked for many years as a specialist in identification, attribution, appraisal and cataloguing for various museums and colleges, including the Metropolitan Museum of Fine Art in New York. He was a Professor of Fine Arts at Bradley University in Illinois (1938-1944) and at Syracuse University in New York (1944-1958). He was the Director of the Crocker Art Gallery in Sacramento, California for 11 years (1958-1968), after which he became a fine arts appraiser, researcher, and restorer for Hunter Gallery in San Francisco. Kent had undertaken private study in Mexico in 1946 and 1952, and apparently also taught at the Mexican Art Workshop (organized by Irma Jonas) from 1949 to 1955. The 1949 workshop was based in Ajijic, with an “overflow” workshop in Taxco. In the succeeding years, the workshop was based entirely in Taxco. Frank Ward Kent. 1975. Untitled. Reproduced by kind permission of Richard Tingen. After he retired from his position at Crocker Art Gallery, Kent moved to Lake Chapala. Kent’s award-winning art was exhibited widely during his lifetime, including at the San Francisco Museum of Art (1934); Springville, Utah (1934-40); University of Utah (1935, 1936, 1939, 1940); the All-Illinois Exhibition (1940, 1942); Peoria Art League (1940-43); Syracuse Art Association (1945, 1946); Heyburn, Idaho (1934); Syracuse Museum of Fine Arts (1944-55); Rochester Memorial Art Gallery, Utica, New York; Pan-Am Union; New Georgetown Gallery, Washington, DC; and the Mexican Embassy, Washington, DC. Examples of his work are included in the permanent collections of the Chicago Art Institute; Rochester Memorial Museum; Syracuse Museum of Fine Arts; Iowa State University; University of Utah; Crocker Art Gallery, Sacramento; and in many private collections. Kent, who died in Sacramento, California, on 14 July 1977, also wrote two art-related books: A Search into the Unknown (1968) and Icons of the Community (1970). Anon. Undated. “Profile of Frank W. Kent, M.F.A., A.S.A.”. 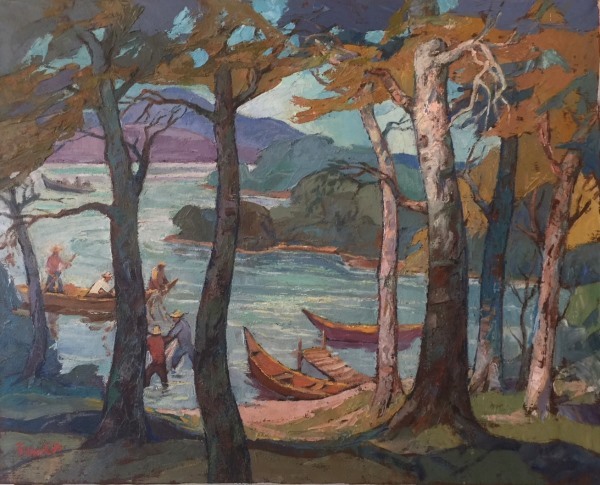 Document that accompanied a painting purchased in 1980 and submitted to askart.com by Dr. Sherburne F. Cook, Jr. of Sherburne Antiques & Fine Art, Inc. in Olympia, Washington. The Decatur Daily Review (Illinois), 2 December 1941, 24. Guadalajara Reporter: 26 July 1975; 14 February 1976. Frank W. Kent. 1964. Crocker Art Gallery – Catalogue of Collections. Sacramento: Crocker Art Gallery. Richard Tingen. Personal communication, 27 Oct 2017.